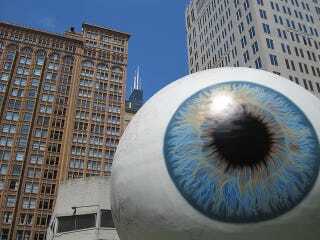 Public art can be pretty weird, but rarely is it as weird as "EYE," an unblinking, three story tall eyeball that's now scaring the dickens out of Chicago. Tony Tasset, the artist and eyeball model behind the work, understands as much: "It's meant to be funny and weird." It is at least one of those things!